The colorful splendor of flora has been a perennial a source of human interest and inspiration, (if you’re in Chicago just take a look out your window), yet while many can appreciate plant color aesthetically, few of us are aware of the science behind it. 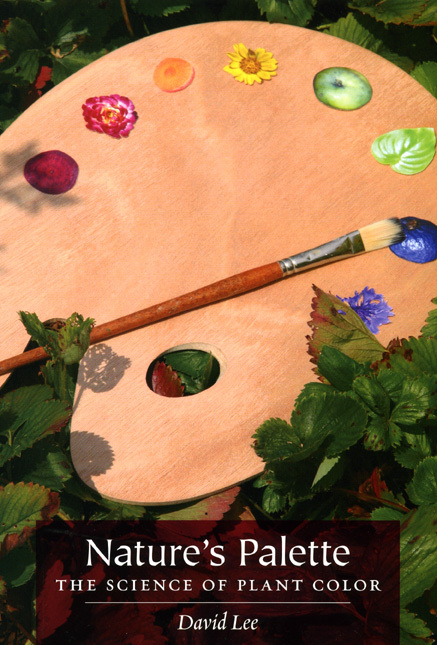 Now, with David Lee’s forthcoming book, Nature’s Palette: The Science of Plant Color, the fascinating story of how and why plants exhibit the brilliant colors they do is revealed. In a recent piece appearing in the October 25 edition of Nature reviewer Philip Ball writes: “Why grass is green, or why our blood is red, Are mysteries which none have reach’d into.” John Donne’s words were true in the seventeenth century. Today they certainly aren’t, as David Lee makes clear in Nature’s Palette, an enchanting survey of color in plants.… Ball’s review continues: Lee’s book is packed with many… gems from botanical and social history. So captivating is his passion for botany that his occasionally bewildering thickets of carotenes and anthocyanins can be forgiven. His paean provides a compelling case that botany is full of intellectual challenges, many shamefully neglected. Read the rest of the review currently available online at the Nature website. . . .
Caitlin Zaloom’s most recent book, Out of the Pits: Traders and Technology from Chicago to London, has factored into several articles this week about the world-wide transition from open-outcry trading to electronic, computer based trading—a transformation that she argues promises a radical change in the culture of the global marketplace. 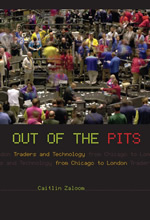 Niko Koppel’s piece in the New York Times cites Zaloom’s comparative account of what two very different financial exchanges—the trading floors of Chicago’s commodities markets where open-outcry trading has been a tradition since the mid-nineteenth century, and a shiny new digital dealing room in the City of London—to describe how this transition is affecting the marketplace. Koppel writes for the NYT: Ms. Zaloom observed that, though pit traders were once the first to see bids and offers, electronic trading has leveled the playing field. “The screens are anonymous,” she said, “and that’s part of the idea of having a more pure market, one that doesn’t have the complications of flesh and blood.” Equal access to the markets has made trading more challenging for pit traders. “We’re trading against machines” all over the world, said Jeffrey Levant, 53, who has been at the Exchange for 29 years, and recently . 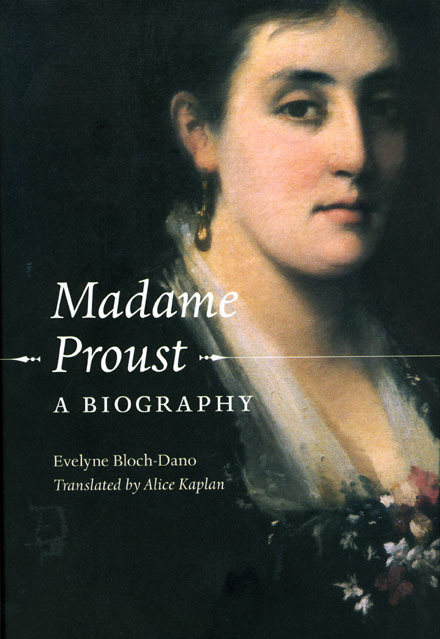 . .
Evelyn Bloch-Dano’s Madame Proust: A Biography, delivers one of the most richly detailed biographical accounts of Marcel Proust’s mother to date. As Bloch-Dano shows, Madame Proust was one of the most important influences on Marcel’s life, and his work. But as a recent review in the UK’s Literary Review notes, Bloch-Dano’s work not only sheds new light on Proust and his literary masterpiece, but also stands on its own as an intriguing social history. Allan Massie writes for the Literary Review: Madame Proust was born Jeanne Weil, Jewish on both sides of her family. Evelyne Bloch-Dano gives a thorough and fascinating account of how Jeanne Proust’s family assimilated in little more than a couple of generations, so that, by the time of her birth in 1849, they were French men and women who happened to be of the Jewish faith, rather than Jews living in France.… This fascinating book is full of interesting social and cultural observation, of information about French Jewish life, the position of Jews in society and, of course, the Dreyfus case. But it is essentially a study of one of the most remarkable and fruitful of mother-son relationships. As such it is a book that every . . .
Dario Maestripieri’s Macachiavellian Intelligence: How Rhesus Macaques and Humans Have Conquered the World was recently featured on the Freakonomics blog hosted at the New York Times website. An offshoot of U of C professor Steven D. Levitt and journalist Stephen J. Dubner’s best-selling book of the same name, the Freakonomics blog takes a look at society through the eyes of an economist, revealing the hidden incentives behind our everyday behavior. On the blog, contributor Ryan Hagan takes note of Maestripieri’s new book not only for its insights on the proliferation of rhesus macaques—currently one of the most successful primates on the planet—but what an understanding of their behavior can tell us about our own. To find out more, see the short but succinct synopsis of the book recently posted to the United Press International website. Marshal Zeringue strikes again! Richard Halpern’s book, Norman Rockwell: The Underside of Innocence was featured this week on Zeringue’s literary blog, the Page 99 Test. On the blog Zeringue asks authors to flip to page 99 of their books, summarize it, and then give a brief explanation of how it relates to the rest of the work. In his piece, Halpern delivers a nice précis . . .
Why do they work the fireline? Fire is being beaten in southern California. The wind shifts, more firefighters and equipment are deployed, and the wildfires—after burning half a million acres and displacing about as many residents—are brought under control. Different stories then emerge. Stories about causes and responses and lessons learned. Stories about heroic and despicable acts. Stories about those who fled their homes and those who fought the flames. “Firefighters are a particular breed,” said California Department of Forestry and Fire Protection Battalion Chief Doug Lannon in a story in the Los Angeles Times. But what does that mean? Burning to death is a hellish way to die. Yet every year men and women across the country risk their lives for low pay to fight wildfires. What motivates them to put their lives on the line and face heat so intense it can melt steel? Understanding the breed that is the wildfire firefighter is the point of Matthew Desmond’s just-released book, On the Fireline: Living and Dying with Wildland Firefighters. 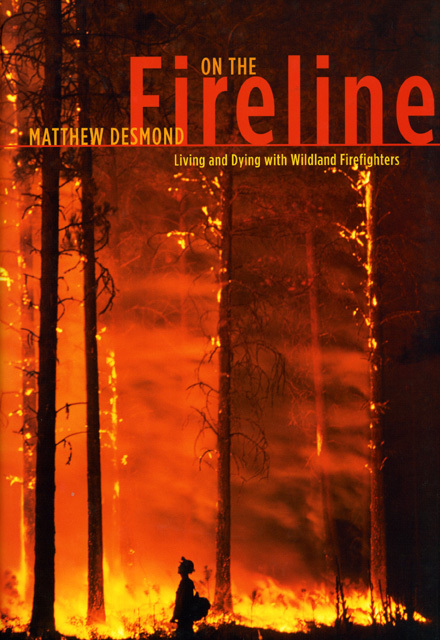 Desmond lived and worked with a wildland fire crew for four seasons and delivers a vivid and sophisticated account of this high-risk work, immersing the reader in their dangerous world. John Maclean, the author of . . .
Now available in paperback— The Bourgeois Virtues is a magnum opus offering a radical view: capitalism is good for us. Deirdre McCloskey’s sweeping, charming, and humorous survey of ethical thought and economic realities—from Plato to Barbara Ehrenreich—overturns every assumption we have about being bourgeois. Can you be virtuous and bourgeois? Do markets improve ethics? Has capitalism made us better as well as richer? Yes, yes, and yes, argues McCloskey, who takes on centuries of capitalism’s critics with astonishing erudition and range of reference. 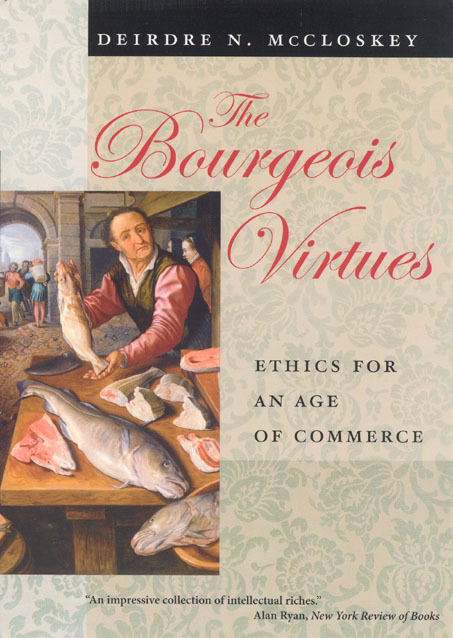 Applying a new tradition of “virtue ethics” to our lives in modern economies, she affirms American capitalism without ignoring its faults and celebrates the bourgeois lives we actually live, without supposing that they must be lives without ethical foundations. Read the press release. . . . The media bombards us with images from Iraq on a daily basis, but as the New Yorker‘s George Packer notes in his blog Interesting Times, “Iraq has not been a photographer’s war.” The iconic images of the war have come from amateurs (Abu Ghraib, videos of beheadings) that have “turned documentary photography into a leering form of humiliation and a potent weapon in the information campaign that is the core strategy of contemporary insurgencies, based on the terrifying principle of can-you-top-this.” In Ashley Gilbertson’s Whiskey Tango Foxtrot: A Photographer’s Chronicle of the Iraq War, Packer finds photographs that have not been drained of humanity. An Australian freelancer in his twenties, went to northern Iraq before the war and has been going back ever since, mostly on contract for the Times. 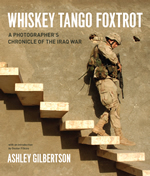 His new book, Whiskey Tango Foxtrot, just published by the University of Chicago, collects Gilbertson’s four years of work from Iraq, with an introduction by his Times colleague Dexter Filkins, and a colloquial, self-revealing text beautifully written by the photographer himself. The pictures chart the descent of Iraq from the initial post-invasion euphoria into the extreme violence of the battles for Karbala, Samarra, and Falluja. They also show . 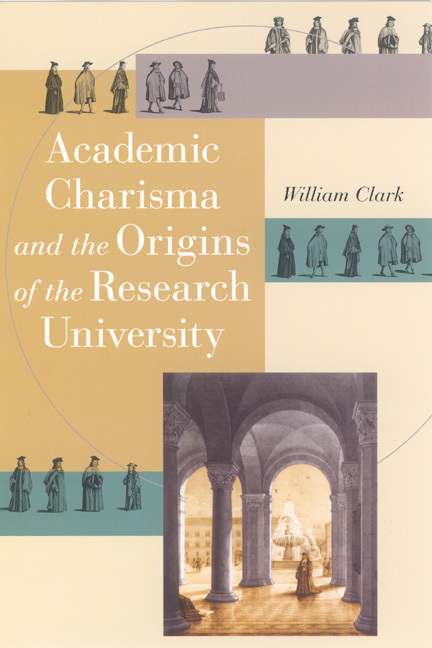 . .
Now Available in Paperback—In Academic Charisma and the Origins of the Research University William Clark argues that the research university—which originated in German Protestant lands and spread globally in the nineteenth and twentieth centuries—developed in response to market forces and bureaucracy, producing a new kind of academic whose goal was to establish originality and achieve fame through publication. With an astonishing wealth of research, Academic Charisma and the Origins of the Research University investigates the origins and evolving fixtures of academic life: the lecture catalogue, the library catalog, the grading system, the conduct of oral and written exams, the roles of conversation and the writing of research papers in seminars, the writing and oral defense of the doctoral dissertation, the ethos of “lecturing with applause” and “publish or perish,” and the role of reviews and rumor. This is a grand, ambitious book that should be required reading for every academic. 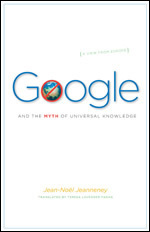 Read the press release. . . .
Now available in paperback— Jean-Noël Jeanneney, former president of France’s Bibliothèque Nationale, here takes aim at what he sees as the most troubling aspect of Google’s Library Project: its potential to misrepresent—and even damage—the world’s cultural heritage. In this impassioned work, Jeanneney argues that Google’s unsystematic digitization of books from a few partner libraries and its reliance on works written mostly in English constitute acts of selection that can only extend the dominance of American culture abroad. Read the press release. . . .
Now available in paperback— Arguably the most influential document in the history of American urban planning, Daniel Burnham’s 1909 Plan of Chicago, coauthored by Edward Bennett and produced in collaboration with the Commercial Club of Chicago, proposed many of the city’s most distinctive features. 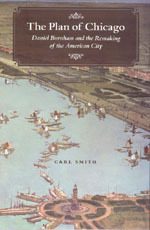 Carl Smith’s fascinating history reveals the Plan‘s central role in shaping the ways people envision the cityscape and urban life itself and points out ways the Plan continues to influence debates, even a century after its publication, about how to create a vibrant and habitable urban environment. Read the press release. . . .